I’ve moved over to a new blog platform and as I learn this new process, posting a year in review of our work in 2018 seemed like a great way to practice and share what were up to in 2018. We kicked off the year in one of our favorite places, Mt. Desert Island, having planned and designed Carly and Chris’ wedding from Maine, while they live in Florida. Chris has Maine roots and Carly fell in love with this special place and with Acadia National Park with Chris. And I fell in love with this beautiful couple. I can do that, right?! Carly has this beauty, genuine and fiery energy, wit and charm, a heightened awareness of everything it seems and Chris is kind and dear, smart, funny and soulful… and you just want to wrap your arms around these two special creatures and never let them go. I was honored to be a part of their meaningful union in this special place. I created the floral design and arrangements for this wedding and whenever I can camp outside, I do. Put those two things together and you would have found me under the great white pines and hemlocks, at the head of Somes Sound, arranging flowers and making bouquets and hair wreath in a net tent on a folding table I brought along with me. Bliss. Carly collected feathers for me to incorporate into the dinner table centerpieces and personal flowers and I even brought Queen Protea I tracked down and drove to pick up in New York City in the floral district, after not being able to get it anywhere locally or from afar by mail. We do what we must! The peonies, dogwood branches and astilbe came from my gardens, the peonies bloomed right on time for Carly, I love it when the seasons and planets align and that happens for our special and so loved clients. A lifetime is woven by the small details and moments that add up to a life, are they not? There are too many photos to share, so many gorgeous, love filled images created by Phil Porto of the Portos, enjoy part of the gallery below. 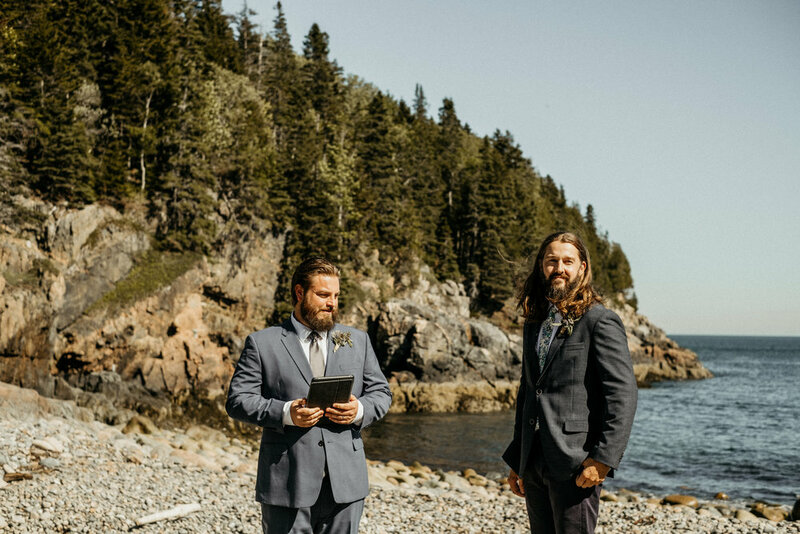 If you have a desire to be married in one of the most magical places on Earth, be in touch with us, we love to plan Acadia National Park weddings and have a lifetime of knowledge of all the secret and best places on Mt. Desert Island and Bar Harbor areas.